The number of times I get asked daily what I carry in Mike’s diaper bag is astounding. Just kidding. No one asks. But I’m a huge US Weekly fan (judge not lest ye be judged folks) and have always enjoyed their ‘What’s In My Bag‘ series. 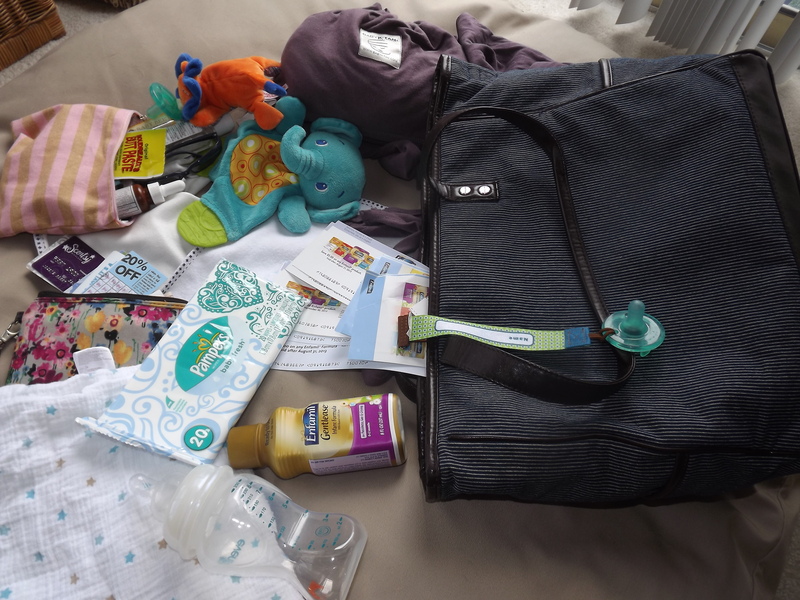 I thought it would be fun to give you some insight into what I carry in Mike’s diaper bag. I promise, there is not one product in there that will break the bank. If you know me at all, I am not a huge fan of ‘baby’ stuff, like diaper bags that look like diaper bags. My Aunt hooked me up at my shower with The Cindy Tote from Thirty One. I love it because it is soft sided and I can use it again (you know – like when I don’t need a diaper bag. That time’s coming right?). I also have a Thirty One wristlet that I think is discontinued. But it’s the right idea! A bigger wallet I can just grab out of the bag and put into a purse when I am baby free. You always have to have a blanket/burp cloth/swaddle/rag. Always. I am a huge fan of the aden + anais line. The are huge swaddles, so perfect to cover a carseat, wrap a baby or wipe up a dribble. Plus they are pretty and Kate Middleton loves them. My Baby K’Tan goes everywhere with me. Mike is getting heavy and lugging his car seat into the grocery store is just a pain in the neck. Plus I am never sure where a meltdown will occur, and the wrap keeps him calm. Where have I worn my baby? Walmart, Harris Teeter, home, office, winery (uh, huh), street festivals … it goes on and on. Enfamil checks/coupons never leave my bag or purse. I have found Mike’s formula on deep discount at a few places and paired the store discount with a check and pay like $2 for a thing of formula. Score. Thankfully Mike is still at the age where a crumpled napkin provides half an hour of entertainment. But I still like to carry a Wubba Nubba and a little toy. Even a book is good. Each page is 10 minutes of excitement! There you have it! What’s your non-traditional must have for your diaper bag? Good call! I think I have some in there, for when we have a stinky diaper at someone’s house or the office. I bet having 2 kids with 1 ‘diaper’ bag is a challenge. I feel like no matter how many times I reorganize my diaper bag it never gets lighter.